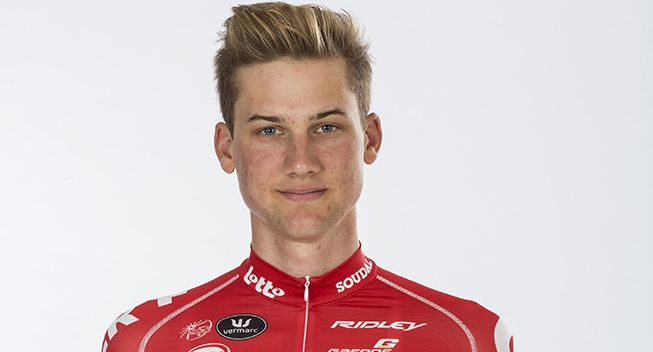 Tim Wellens beat heavy rain, breakaway companion Adam Yates and a peloton depleted by the stormy conditions to win the 6th edition of the Grand Prix Cycliste de Montreal on Sunday. The 24-year-old Belgian, recent winner of the Eneco Tour, timed his move perfectly in the last ascent of the Camillien-Houde climb, going in the wheel of Adam Yates to finally outspent him on the line to clinch his major victory to date. Portugal's Rui Costa, winner here in 2011, took third place for his fourth podium place in the Grands Prix Cyclistes de Québec et de Montréal. The start was given shortly after 11:00 to 167 riders. Bernhard Eisel (Team Sky), who broke his wrist in Québec City, did not start. Thomas Voeckler (Team Europcar) and Julian Arredondo (Trek Factory Racing) were the first attackers of this rainy day, quickly emulated by Marc Soler (Movistar Team). The three were joined by 11 riders at kilometer 9, putting 14 riders in the lead: Simon Yates (Orica-GreenEdge), Louis Vervaeke (Lotto Soudal), Axel Domont (AG2R La Mondiale), Xavier Zandio (Team Sky), Sam Bennett (Bora-Argon 18), George Preidler (Team Giant-Alpecin), Jos Van Emden (Team Lotto NL – Jumbo), Samuel Spokes (Drapac Pro Cycling), Ilnur Zakarin (Team Katusha), Julian Alpahilippe (Etixx-Quick Step), Julien Berard (AG2R La Mondiale), along with Voeckler, Arredondo and Soler. In the third ascent of the Camillien-Houde climb, the 14 were pulled back as the peloton split in several groups. At the third passage on the line, Tour de l'Avenir winner Marc Soler attacked again to go solo. He was later joined by Spokes and Christopher Juul Jensen (Tinkoff-Saxo). But breaks kept being pulled back as the peloton tended to split in the climbs and regroup in the descents. It took 70 km for another 20-man group to emerge, including Soler, Juul Jensen, Simon Yates, Zakarin, Diego Ulissi (Lampre-Merida), Mathias Frank (IAM Cycling), Danny Pate (Team Sky), Tom-Jelte Slagter (Team Cannondale-Garmin), Greg Van Avermaet (BMC Racing Team), Warren Barguil (Team Giant-Alpecin), Jakob Fuglsang (Astana Pro Team), Michael Albasini (Orica-GreenEdge), Bruno Pires (Tinkoff-Saxo), Yves Lampaert (Etixx-Quick Step), Julien Vermote (Etixx-Quck Step), Tim Wellens (Lotto Soudal), Enrique Sanz (Team Movistar), Cesare Benedetti (Bora-Argon 18), Paul Voss (Bora-Argon 18) and Rein Taaramae (Astana Pro Team). But as they were pulled back, another group emerged with such solid riders as Romain Bardet (AG2R La Mondiale), Michal Kwiatkowski (Etixx-Quick Step), Wilco Kelderman (Team Lotto NL – Jumbo), Silvan Dillier (BMC Racing Team) and Barguil, Albasini and Fuglsang. They were briefly joined by Jose Herrada (Movistar Team), Brent Bookwalter (BMC Racing Team), Matteo Bono (Lampre-Merida) and Michael Valgren (Tinkoff-Saxo) before being pulled back again. World champion Kwiatkowski briefly charged ahead to come first at the top of the Camillien-Houde climb. As that attempt was quashed once again, Voeckler attacked once more and was later joined by Vervaeke and Manuel Quinziato (BMC Racing Team). The three were chased by Juul Jensen and Andriy Grivko (Astana Pro Team) as the peloton, led by Orica-GreenEdge, was just under two minutes adrift. Grivko dropped the Dane to join the three-man break and the four maintained a two-minute lead as a storm broke over the peloton. In the penultimate lap, Quinziato and Grivko were unable to stay with Voeckler and Vervaeke, who were joined by Michael Valgren in the finale. But Orica-GreenEdge were only playing cat and mouse with the escapees and they were caught into the final lap as Etixx-Quick Step joined the chase. In the last climb, Adam Yates (Orica-GreenEdge) moved ahead, followed by Wilco Kelderman (LottoNl-Jumbo), Bardet, Tim Wellens (Lotto Soudal), Rui Costa (Lampre-Merida) and Jan Bakelants (AG2R La Mondiale). Yates and Wellens broke clear in the ascent, followed by their four breakaway companions. The two held their ground into the finale and battled it out for the win in the last stretch. Yates launched the sprint but could not resist the return of Wellens and had to settle for second, like his team-mate Michael Matthews in Quebec City. Rui Costa, the winner here in 2011, finished third.